Question: I am turning 50 in a few weeks and am beginning to feel some of my age especially after I workout. Are there any tips you can provide about how to modify my workouts to keep my joints from feeling worse after training? Answer: Knees, shoulders and elbows can often flare up, ache or even generate sharp pain after training if you don’t take measures to prevent issues. The most obvious is to stop using exercises that hurt or cause you pain after the workout. 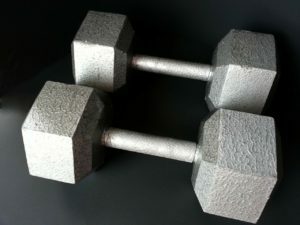 For instance, if shoulder presses are uncomfortable switch to dumbbell upright rows. Both exercises primarily work the medial head of the deltoid but uprights don’t load the AC joint as heavily. You can replace squats with leg presses which, for most people, don’t stress the knees as much. Another helpful method which actually increases your potential to build muscle is to slow the eccentric or lowering portion of the rep. This is not intended to be the slow motion method of training but to improve control of the weight. Lee Haney used to say ” Control the weight, don’t let the weight control you.” By slowing the movement you will load the muscle more and decrease the momentum of the exercise. This lowers the stress on the joints involved by keeping the muscles more engaged. It also increases the ” time under duress” for the muscles being worked and improves the mind/muscle connection. At the peak of the exercise make a conscious effort to fully contract the muscle. You’ll find your muscles are completely exhausted by working the muscle instead of moving a weight. Finally, decrease the amount of weight you use. Though it can be difficult to do, it’s more productive. What you’ll find is the slower eccentric movement and peak contraction will require you to decrease the weight anyway.